I think I've read all of Carmack's NA novels so when I read that she was delving into YA I was pretty interested, though somewhat weary. When I heard it was a fantasy novel I was even more interested, and perhaps wearier. Going from one targeted age group to another isn't always something authors can do well, and the same goes for genre, so for Carmack to do both it was both exciting and a little worrisome. In the end, there was nothing to worry about. Roar was fantastic! The characters, the plot, the setting, the detail, all of it was done expertly and it all combine into a novel that I didn't want to stop reading. As I said above pretty much every aspect of the novel was spot on, but the piece of it that I loved the most has to be the setting. The world Carmack has created was vibrant and fresh and while I'm not 100% sure it's some place I would want to live, I think it would be pretty darn cool to visit. The idea of a world plagued by magical storms is such a fascinating one. Initially, I was reminded of Avatar: The Last Airbender and Susan Dennard's fantasy (also published by Tor) Truthwitch, but honestly this world is entirely its own. Just because you have what is called an "affinity" for a particular kind of storm doesn't mean that you can bend it to your will, you just have a slight advantage over those who don't. And unlike pretty much any other story/world I can think of you can't use that affinity to create storms. In fact, it reminded me a little of Yu-Gi-Oh/Pokemon, you have the cards/creature, or in this case the affinity, but you still have to battle it out in order to gain a new stormheart. The other thing I really enjoyed was the characters. I'm one of those people who loves reading books that have at least two POVs, just because I think it's fun to get into the heads of more than one character, especially if those characters have a thing for each other, so getting into the heads of three or four characters in this novel was a lot of fun, and while there was no distinct labeling of whose eyes we were looking through the transition was done well because there was a small break between sections to keep it from being confusing. It was also nice that all of the main characters had dimension to them, they were more than just one thing, and I really appreciate that. I found myself connecting to Aroura/Roar and how she wasn't sure who she really was. It was fascinating the way Cassius was hard but wanted to soften, and how Locke completely reinvented himself in an effort to protect whatever he had left. I also can't express how much I loved the side characters. I think I could probably read a whole book about the other storm chasers just because they were so much fun. My favorite was Jinx, and I hope we get to learn more about not only her but about all of the other minor characters in the sequel. There were a few things about the story that I didn't LOVE, but they were pretty small all things considered. It could be argued there's a little bit of a dual love interest going on, and Aurora seems to develop feelings for both guys rather quickly. It might annoy some people, but if you think about the way she was raised, never really able to develop relationships of any kind (platonic or romantic) with anyone it's not surprising that she was attracted to two hot guys who paid her attention. The other thing is that it might be considered a little formulaic at times, it seems to follow the general plot outline of several other YA fantasy novels, but let's be honest, is there really a storyline that doesn't mirror at least three or four others at this point in time? I'm pretty sure that original plot arcs haven't happened for several hundred if not thousand years. I also would have liked to see Aurora use the knife skills she displays early on in the novel out in the wild, but I can see why it wouldn't have really fit in with the story. All together I was REALLY pleased with this novel. Carmack transitioned from NA to YA expertly, and it's obvious that a lot of thought went into the fantasy world she's created here. The world itself is pretty darn original, and I'm excited to see where she takes it next. Her characters are well thought out and nicely flawed, and a lot of people are likely to connect with at least one of them for one reason or another. If you're a fan of the Throne of Glass series or the Truthwitch series I suggest you give this one a try too. 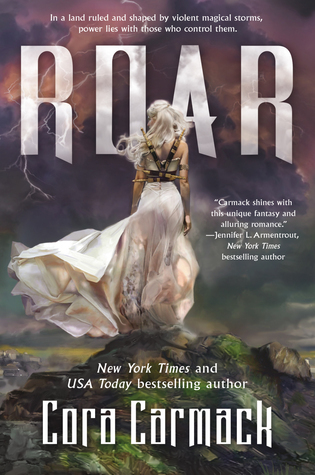 Actually, if you're a fantasy fan in general I would suggest looking into Roar. Fans of Carmacks NA novels and new readers alike are sure to enjoy the world she's created here, and I for one can't wait to see where she takes it next.